I can't even pretend that this is a meal I would have selected on my own. While I'm normally on board for trying almost any type of ingredient (I currently draw the line hard with sardines), cabbage just isn't the type of thing I pick up - ever. Not for any good reason either. It just never struck me as interesting - and I think I still stand by this statement. No negative vibes for cabbage, just also no gold stars either. So this was my second of three Blue Apron meals with the first being the DELICIOUS smoky cod dish. The benefits of a meal like is are really that leftovers are ready in a pinch - but the downside being this is only really an "at-home" food. I can't take leftover tacos to work. Pineapple // super refreshing and sweet. Protein Mixture // While I always love pork, I'd probably mix half ground turkey and half ground pork the next time. 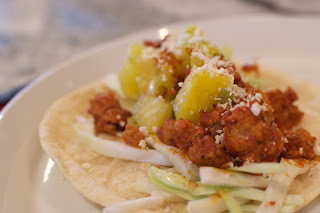 Cheese // I've never had this type of cheese (Cotija) before - and clearly I need to break out of my shell. I'm not sure that I'd be able to find this at my suburban grocery store but it is worth a shot. Cabbage // Thinly slice the cabbage and combine in a bowl with the juice of 1/2 lime, olive oil, salt and pepper. Toss it around and then let it sit. You want to do this first because it needs more time to marinate together. Salsa // Super easy. Dice the pineapple into small pieces and add in jalapeno to taste. I don't like things super spicy so I just did a quarter of jalapeno. Juice the rest of the lime (e.g. 1/2 lime) and then zest it. Mix and let sit. 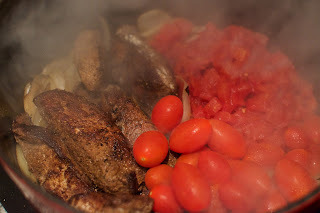 Pork // Heat a skillet with olive oil to medium / high heat. Cook the pork until it begins to brown. Break down the larger pieces with a spoon so as to have a more uniform mixture. Add garlic, tomato paste, the spice blend, and 1/2 cup of water. Cook until the sauce is the consistency that you like. Tortillas // Toss the tortillas into the heated oven for about 1 minute. Keep an eye on them. You are just trying to warm them up. Other people would suggest wrapping them in tinfoil but it seems unnecessary. Despite my love of grocery stores and cooking, there is something incredibly appealing about how meal delivery services package and send their meals. After getting about one million offers in the mail, I decided to try out Blue Apron recently. I was in a bit of a cooking lull and it was only $30. While I will never become a regular subscriber, I did totally appreciate the convenience and luxury this meal gave me. 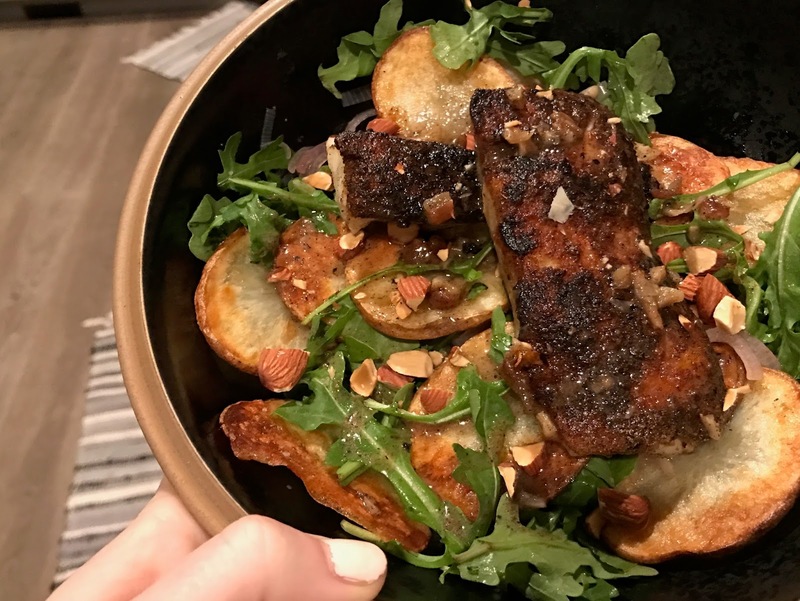 On a random Monday night, I made smokey seared fish with roasted potatoes and pickled shallot. I've never pickled anything (except cucumbers) for a meal and that will be changing. So easy and so different. Plus, there was nothing about this meal that made it challenging to replicate - which is why I've written it all down here so I can do it again. This recipe is really about making the components. The potatoes take the longest so start there and make your way through the other components. Theoretically, by the time you get to the fish your potatoes are either done or close. Then put it all in a wide, shallow-ish bowl (or plate) and you are good. P.S. I'm becoming a firm believer that all meals should be eaten out of bowls. Potatoes // Cut potatoes into 1/4 inch slices and place on a parchment lined baking sheet. Drizzle with olive oil and sprinkle with kosher salt. Cook in the oven for about 20-25 minutes. Keep half an eye on them and you can flip them over after the first side is lightly brown. Remove from the oven. Pickled Shallots // Thinly slice the shallot and place in a pot on the stove. Add the sugar, vinegar and 1/4 cup of water. Heat to boiling and stir until the sugar has dissolved. Pull from the heat and let cool. Cod // On the base of a plate, combine a little bit of flour and paprika. 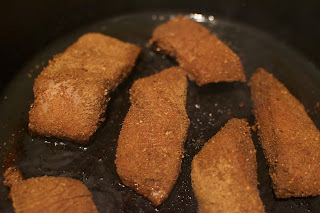 Take your cod fillets and pat them dry with a paper towel and then press one side lightly (but firm) into the spice mixture. Heat a skillet to medium/high heat with a bit of olive oil. Take the cod fillet and place it spice side down into the skillet. Cook 3-5 minutes on the first side and then flip for 2 minutes. You'll know it's ready when you have a nice brown crust appearing on the spice side. Sauce // Just after you've flipped your fish, you can make the sauce. It's really easy. Just add 1/4 cup water, butter, chopped figs, and chopped garlic. If you are feeling indulgent, spoon your sauce over the fish a bit. It's not necessary but it does add some flavor. Pull the skillet from the heat and squeeze a lemon over the fish. Plating // Divide the potatoes amongst two plates/bowls and combined with a healthy handful of arugula. Add the pickled shallots (w/o the liquid) and mix it up. This is the base for your fish. Then just plate your fish on top and pour the sauce over each fillet. Sprinkle with chopped almonds. Probably about 6 years ago, I made my first chicken tagine. I've always reflected positively on that meal. 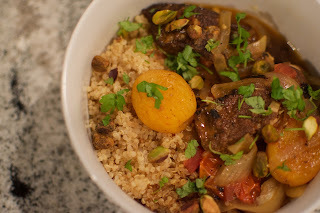 The flavors of a tagine are just incredible - and really all without my favorite sins of salt, butter, or cheese. 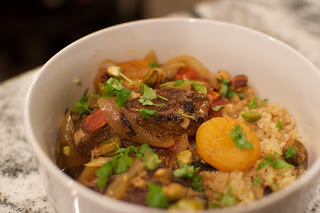 I tore out this chicken tagine recipe from Real Simple relatively recently and got around to making it this weekend. If you have a relatively strong pantry, you probably will only need to pick up the apricots. It's always incredible to me what magic can come out of my cabinets. Quick // Unlike many meals that are rich in flavor, this one is really done in about forty minutes start to finish. There is no marinating and you only chop 1 thing - an onion. Quinoa // A tagine like this absolutely requires a grain - and quinoa is a good fit. I'm not a raving fan of quinoa these days. I overdosed on it in salads for like a year and just haven't been able to get back into it - however, it's perfect in this case. Chicken // The original recipe called for chicken thighs but I am working through the contents of my freezer.... so I went with chicken breasts. I had two oversized thinly sliced chicken breasts and that worked out to about 4 servings. So go ahead and make this meal - and absolutely don't skimp on the pistachios and the dried apricots. 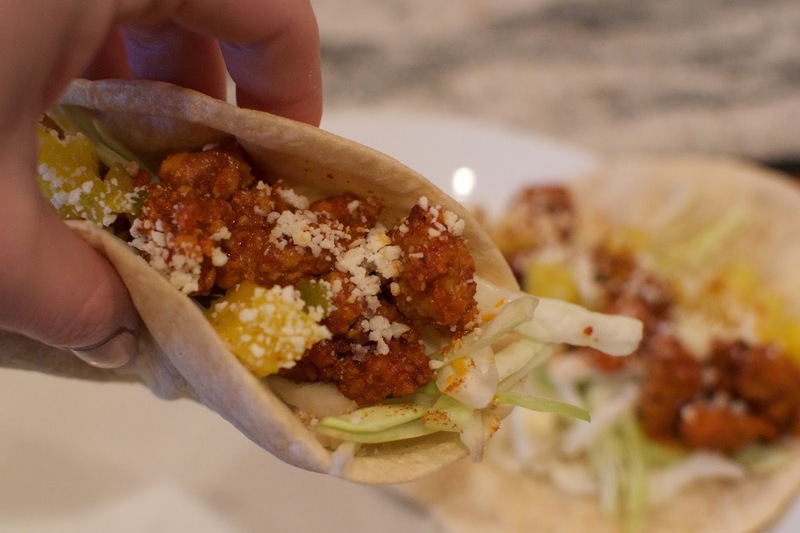 This is a great meal for the Sunday night dinner that you'll enjoy a few more times that week. Mix the cumin, ginger, coriander, cinnamon, and salt together in a large bowl. Add the chicken and toss to coat. 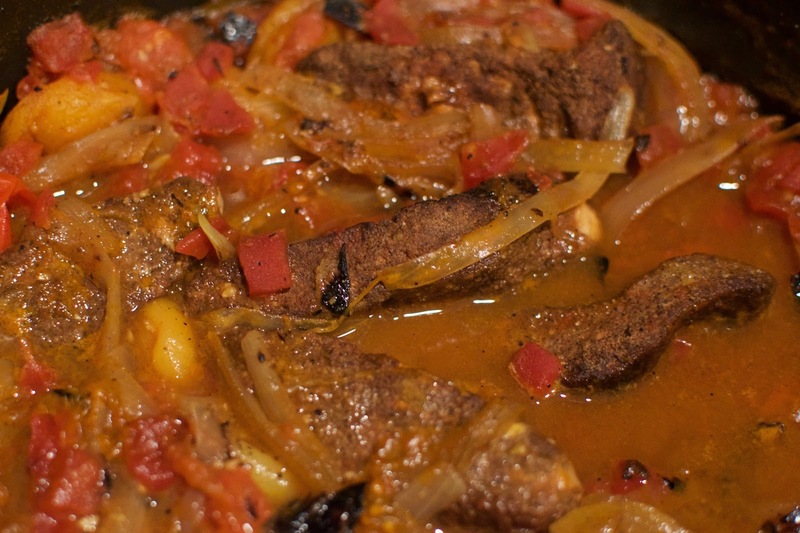 Heat 2 tablespoons of the oil in a large, heavy-bottomed pot or Dutch oven over medium high. Add the chicken and cook until browned, about 2 minutes per side. Transfer to a plate. Add the onions to the pot along with 2 tablespoons of water. Cook, stirring often, until the onions are soft, about 5 minutes. Return the chicken to the pot along with the canned tomatoes, cherry tomatoes, apricots, and broth; bring to a boil. Cover, reduce heat to low, and simmer until the chicken is cooked through, 20 to 25 minutes. Serve over the quinoa, topped with the parsley and pistachios. 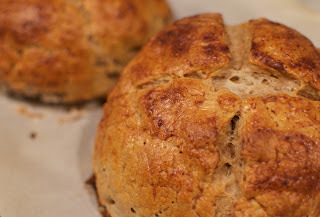 For like the last 10+ years I've made Irish Soda bread each year for St Patrick's Day. I've really pared back the baking in recent years - but there were some years that I shipped out 8 or so loaves. This year I think I only have 4 loaves on my list - and one belongs to me. But, last week when I was tearing through some magazines I came across this run of recipes for St. Patrick's Day ... and they all looked really great. ... But this clodagh bread captured my attention. When I tore out the recipe, I neglected to save the picture but I remember it being kind of an enchanting rustic loaf of bread. Irish soda bread feels country and rustic. For pretty much no good reason, Clodagh bread does not. It's perhaps in part because I still am not sure how to actually say "clodagh". Some things that are really unique about this bread? 7 ingredients - of which 2 are types of flour. You could probably make this bread right now ... if you have whole milk. Because of the lack of fat via shortening or butter, I think the whole milk and whole milk yogurt is actually important. Glaze. I was really questioning whether or not I was doing this right - but I painted the entire loaf pretty aggressively with the yogurt milk mixture. After 30 minutes in the oven, the loaf gets this incredible shine that my bread has never had before. After mixing the ingredients, my dough was much drier than I expected. If I had more whole milk or yogurt, I would have liked to add a little more in to pull the dough together better. I was pretty worried that the bread would be very dry - but the glaze adds a great deal of unexpected moisture. It's absolutely required. 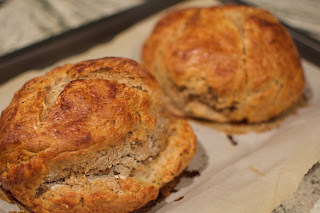 I'm still going to make Irish Soda Bread this year but it's nice to have another traditional Irish recipe in my repertoire. Preheat the oven to 425°. Into a large bowl, combine the two types of flour, baking soda, sea salt and rosemary. Ideally, you'd sift the flours together but life isn't always ideal - just combine them as you would. In a separate bowl, whisk 1 3/4 cups milk and 1 cup yogurt. Slowly pour the milk mixture into the well in the flour mixture. Combine either with a wooden spoon or by using a dough hook on a stand mixer. 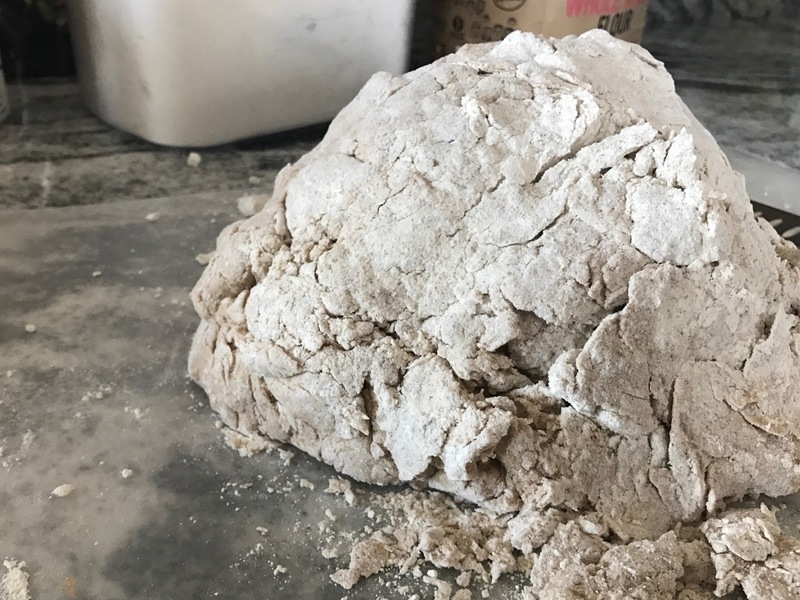 Using lightly floured hands, dump the dough on the counter. I decided to split the loaf into two for easier sharing. Shape the dough into a round loaf and transfer to a baking sheet. Cut a large X into the top of the dough. Cut about an inch through for the X (or up to 2/3 of the way through the loaf). In a small bowl, whisk the remaining 2 tbsp. milk and 2 tbsp. yogurt. 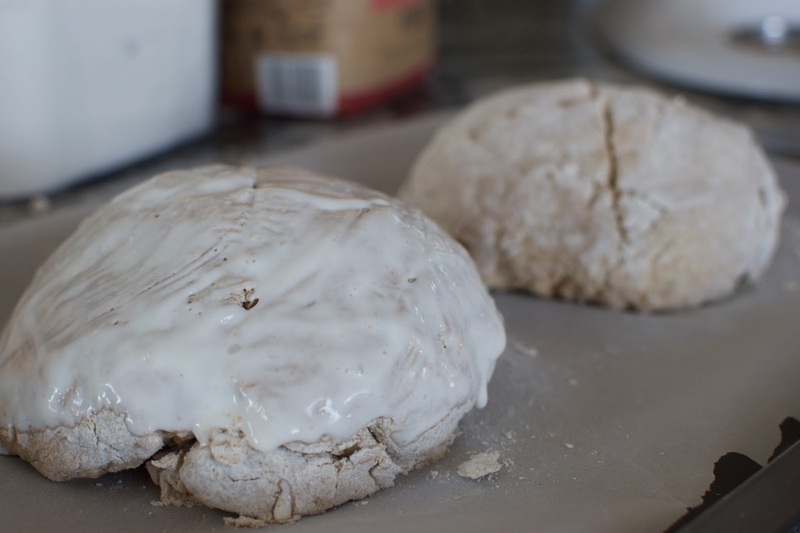 Using a pastry brush, coat the bread with the milk and yogurt mixture. Sprinkle with sea salt. Bake 20 minutes. Reduce the heat to 375° and bake until the top is dry and deep golden brown and the bread sounds hollow when tapped on the bottom, about 35 minutes. Let cool on a wire rack, at least 2 hours.